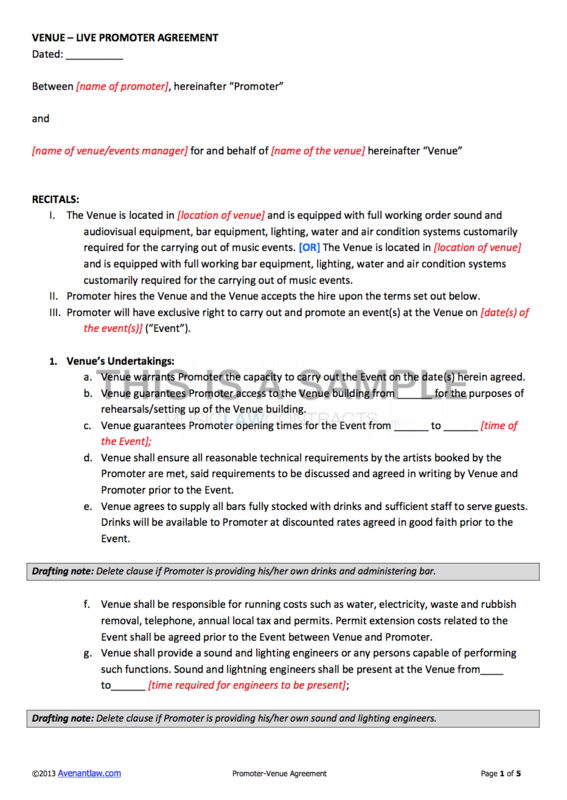 This is an agreement whereby a promoter hires a venue for a particular date in exchange for payment of a fee. The Venue will guarantee the promoter certain capacity and opening times as well as reasonable technical requirement required by the artist performing at the event. The promoter agrees to be solely responsible for all costs related to the promotion and marketing of the event and to be liable for any fines imposed on the venue related to said promotion. Both parties agree to act in a professional manner at all times to not act, omit or operate negligently or recklessly resulting in the impossibility to carry out the event. The contract can be customised to allow the promoter to provide his/her own bar stock, sound engineers and security for the event.